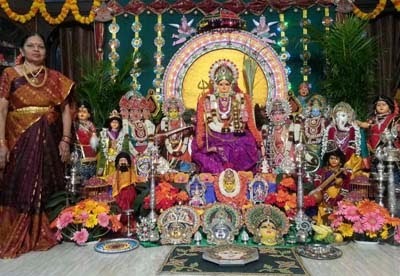 Bommai Kolu, or Bommala Koluvu, is the artistic display of dolls by women during Navratri and Dussehra in Tamil Nadu, Andhra Pradesh, Karnataka and among certain communities in Kerala. In 2019, Navratri Bomma Kolu begins on September 29. The dolls, called Kollu or Golu, represents the durbar or assembly of Goddess Durga. This assembly is held just before Mother Goddess ventures on her mission to slay Mahishasura, the buffalo-headed demon. Therefore when depicted along with the ‘kolu,’ Goddess Durga is also referred as Mahishasura-mardini. Earlier, special artisans were invited to homes to create kolu dolls. But nowadays most people rely on readymade golu dolls and ‘special Bommai kolu’ sets that hit the market during the period. The kolu arrangement is a forte of women and young girls. Creative women add new dolls to their collection each year. Some women collect dolls throughout the year keeping in mind the Navratri Kolu. It must be noted here that some of the dolls used in Navratri golu are very old as they have been handed down to generations. But sadly the Bommai Kolu ritual is no longer held as elaborately as they used to be in houses. Nowadays, people rarely find time to collect or make dolls and therefore the Bommai Kolu is slowly becoming a community affair. 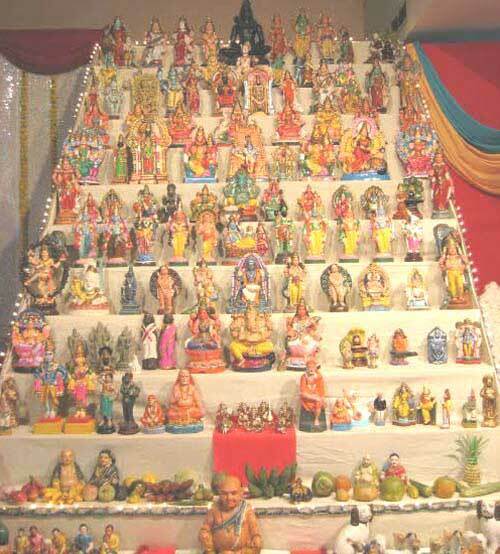 The huge collection of dolls from various households in an area makes the community Bommai Kolu a grand affair. How Are Golu Dolls Traditionally Arranged During Navratri? The Navratri or Dasara kolu is displayed on stairs created from wood. The number of steps depends on the availability of the dolls. The maximum number is nine – representing the nine days of Navratri. Usually, the steps erected are odd numbers – 1, 3, 5, 7, or 9. There are no hard and fast rules for arranging the dolls. Nowadays, the arrangement depends on the availability of dolls. In most places, the entire nine steps will be filled with statues of various gods and goddesses in Hindu pantheon. For some, the Navaratri Kolu is a simple arrangement of various deities in three steps. The topmost three steps are dedicated to various gods and goddesses. In some areas, people place a ‘Purna Kumbha’ on the topmost step. The next three steps – 4, 5 and 6 – are dedicated to Gurus, saints, religious personalities and other highly respected figures in the country and world. The seventh step is dedicated to various social activities and festivals. People depict marriages and important festivals in this step. Business, crafts and other economic activities are depicted in the eighth step. Creative women depict a buzzing market place and other activities. The ninth step is dedicated to dolls made of wood. Dolls of men, women, children, animals and birds are placed in this step. During Bommai Kolu, the entire neighborhood, friends and relatives gather in a house and sing bhajans dedicated to Goddess Durga. Special sweets are prepared during the period. On the Vijayadashami day (the tenth day), the dolls are taken out. 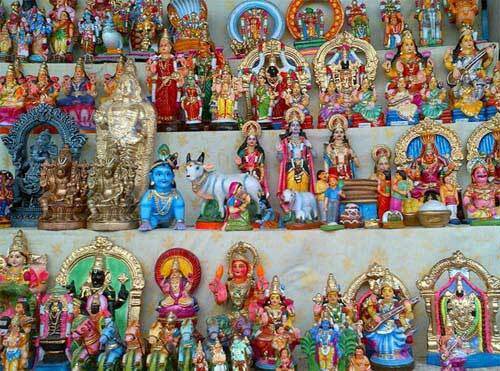 Each year during Navratri, the Madurai Meenakshi Temple in Tamil Nadu displays nearly 800 kolu dolls. The thematic kolu display attracts thousands devotees during the period. The display is on for 17 days. The thematic ‘kolu’ which consists of over 800 dolls will be kept in 17 days put up with flex boards and wooden planks on one side of the second corridor near the sanctum sanctorum of Goddess Meenakshi as has been done for the last three years. The ‘vaahanams’ of the temple will also be kept in nine separate bays. The thematic ‘kolu’ will also have working replicas of the Meenakshi temple and the festivals celebrated, on display. These include one replica of the Teppam festival held at the Teppakulam, one of the various ‘vaahanams’ which include the ‘Rishaba vahanam’ and the ‘Garuda vahanam,’ circling the temple. Apart from this, there are replica of the sanctum sanctorum of Goddess Meenakshi which will have the golden chariot encircling it. The famous legend of Lord Muruga and Lord Vinayaka taking on a challenge for the ‘Gnanapazham’ are depicted through a series of models. Lakshmi Panduranga, a housewife from Basavanagudi in Bangalore in Karnataka, makes Navratri dolls – the Bommai Golu Dolls. She stands apart from those who dash to the market to buy Navratri Dolls. She uses pictures of Hindu Gods and Goddesses as reference and creates murtis for Navratri. Her murtis are simple and noteworthy. Lakshmi makes her dolls with wax and clay moulds using rice flour. She refers to the picture and draws the outline. The rituals is known as Gombe Habba in Karnataka.